A while ago Nat and I were lucky enough to work with Underworld’s design collective Tomato on an ad. Sadly (and unsurprisingly) Karl and Rick couldn’t do the music for it – they were a bit busy on a little project they were working on for their old chum Danny Boyle. Having spent the weekend mesmerised by how good the opening to the Games was, (the only discernible flaws being Seb Coe’s mandroid delivery, and the discontinuity in the lighting during the Bond/Queen sequences) I’ve just bought the soundtrack and I implore you to do the same! 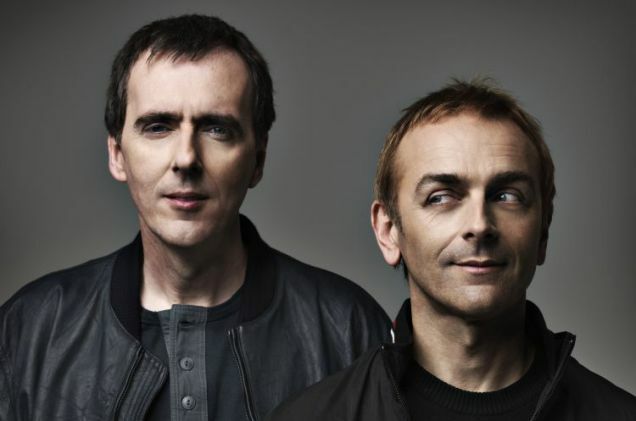 Not just for the incredible music (two beautiful new tracks by Underworld that were so moving where they appeared in the ceremony – ‘Caliban’s Dream’ and ‘And I will Kiss’. But also because you get two very beautiful pieces of writing with it. One by Danny the Champion of the World. And one by Rick Smith, the man responsible for the sound. It’s such a lovely hymn to Britain’s aural landscape that I wanted to share it here in case you don’t buy the album. “How do you soundtrack a city? Or a nation? Is there a score to be written for this green and pleasant land of song, our forever awe-inspiring country? How do you start to summarise the very sound of a place when – in just under two hundred years – one small border town is capable of producing both Edward Elgar and F Buttons? You can’t, so you don’t even try. You follow your heart and you look for the defining moments in culture, the sounds that continue to resonate. It’s the peal of bells drifting miles across the Welsh valleys and it’s the shudder of bass that shakes the foundations of an underground house club in Dalston. It’s the gentle picking of guitar strings around a festival campfire and it’s the bombast of a band at the height of their powers playing beneath the impossible arch of Wembley Stadium. It’s the tinny sound of R&B coming from a mobile phone speaker on the top deck of a bus and it’s the children’s choir from Southwark. It’s the distant echo of steel pans. It’s the bosh of a drum. It’s the hum of traffic. It’s the London Symphony Orchestra and it’s the warmth of Studio 2 in Abbey Road. It’s all this and so much more. Music is Britain’s cultural heartbeat; it’s a perpetual act of revolutionary thought. From William Blake to the Beatles via the Clash and the Chemical Brothers, the soundtrack to our lives fizzes and hums all around us like a stray signal from a radio dial that your internal antenna just can’t help but tune into. Two hundred years ago Goethe said that architecture was like frozen music. Well in today’s Britain the inverse is true, music is the fluid architecture all around us. Rick Smith Music Director London 2012 Olympic Games Opening Ceremony. What a genius. Here’s wishing him a speedy recovery from his exhaustion. To quote Caliban again, we can only dream of working with him now! I understand you feel strongly, but this is an emotional argument full of unsubstantiated rhetoric. Do you have a rational argument backed up with facts? I would say Bill Gates investment with Monsanto and proselytization of vaccines instead of clean water and birth control is a good starting point to outline that Bill Gates is a terrible example to use. Monsanto also own Xe. You might know them better as Blackwater who rebranded to Academi who then rebranded to Xe to confuse the point they murder people. I’ve always thought you’d be the most interesting person in advertising to argue philosophy of wealth creation with Dave but at the end of the day I’d lose because you’d be best off sticking to the lessons you learned in a successful career but as I like to point out, wig wearing lasted longer than contemporary branding. It’s here to stay but not as we know it…. I think. I don’t agree with Mark’s criticism of your thinking, or with Steve’s essentially similar critique in his blog (June 24th). I think they both misunderstand what you mean by ‘predatory thinking’. Steve cites the recent campaign for Coca-Cola, which brokered an outbreak of peace between Pakistan and India, as an example of being ‘nice’ rather than ‘predatory’, but my guess would be that you’d cite this as a perfect example of ‘predatory thinking’. After all, it took sales away from rival brands. End of, right? In this view you can be (strategically) ‘predatory’ and (executionally) ‘nice’ all at the same time, so what’s the problem? I think the simplest way to explain this is by looking at another example of ‘predatory thinking’ from those good folk from Atlanta. In the late 80’s Coke (in the person of Roberto Goizueta) made the then-radical decision to switch attention from winning new customers to growing sales among existing consumers, many of whom were already heavy users. This change of focus saw Coke grow sales by 50% (from an already impressive 10 billion cases) and their share price quadruple. Now you don’t need to be an anti-capitalist to be made a mite uneasy by this decision, given the epidemic of obesity and diabetes sweeping the US at this time. In marketing terms it was a masterstroke of ‘predatory thinking’; in its impact on public health, not so much. I guess the upshot of all this is that markets are fundamentally amoral; not good or bad – amoral, so it’s probably best not to make any moral claims for brands such as those Steve was attempting to make in his blog. This is the real point Mark was making – in an era of overconsumption the whole premise of marketing, in its current form, is regressive. You couldn’t want for a better example of this than the case of the great philanthropist, Mr Buffett himself. In 1988 he swam against the tide and helped himself to a hatful of shares in, you guessed it, Coca-Cola. He made about $10 billion on the deal. A killing indeed. Absolutely Tom, thanks a lot. Hopefully that clears things up for Mark. Is the new ‘zeitgeist’ pretending that there is no man behind the curtain or that there is no man and no curtain? I call this the capitalism versus wealth creation debate. You can tell someone hasn’t got it when they argue that capitalism has been distorted or co opted. It’s a fair point, but as Byron Sharp showed in “How Brands Grow”, the Pareto Principle in marketing is vastly exaggerated – and in fact, concentrating only on your heaviest-buying customers is not a recipe for growth. Advertising needs to target both light and heavy users to be truly effective.